The first reference of its kind designed specifically for PAs, Orthopaedics for Physician Assistants is a comprehensive, portable handbook that helps you master orthopaedic physical examination and history taking, imaging interpretation and diagnosis, and treatment strategies - essential knowledge that directly affects your patient care. 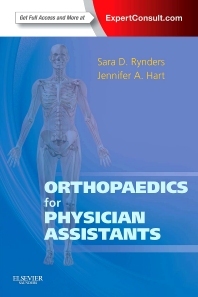 Authors Sara Rynders and Jennifer Hart present precisely the diagnostic and procedural information you need with this easy-to-use, PA-focused orthopaedic resource! Learn how to interpret and correlate lab and diagnostic procedures, reach an accurate diagnosis, formulate effective treatment plans, and implement therapeutic strategies. Quickly grasp pertinent information with brief, bulleted text enhanced with clear diagrams and images. Easily follow the guidelines for each procedure thanks to consistent headings in each chapter and a handy outline format. See how to perform 14 key joint injections with online videos demonstrating elbow joint injection, knee joint injection, medial epicondyle injection, subacromial injection, digital block, and more. Access the entire text and illustrations online at www.expertconsult.com.